When the custom bike revival began in earnest a few years ago, the bulk of builds were Cafe Racers based on the best of British from the ’60s and the Japanese legends of the ’70s. 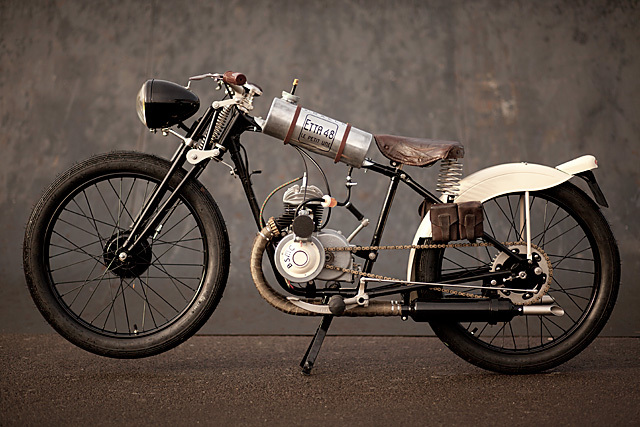 But as the scene grows, many builders have looked back decades earlier for both inspiration and donor bikes. 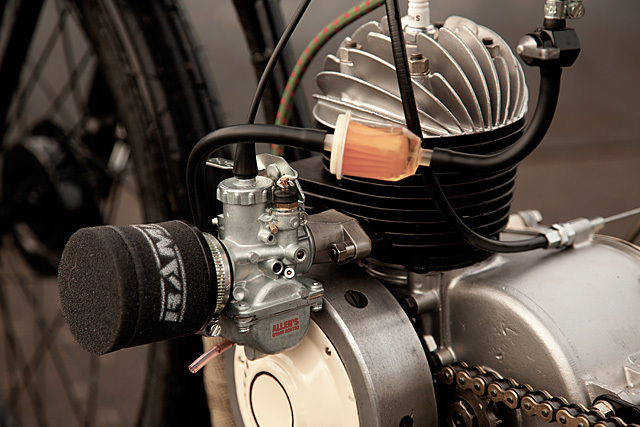 For Pip Davidson, it started by joining the BSMC and with a few builds under his belt picked up an imitation Board Tracker, a bicycle really, with a 60cc mini bike engine. But it gave him an idea. What about the real thing, built from a small capacity machine, girder front end, vintage and rare? 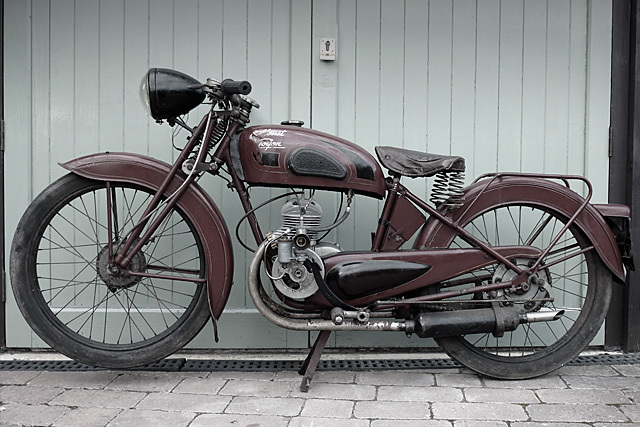 So after a long search and a winning auction bid, he found himself the perfect donor for his very own take on a Board Track Racer, a French 1948 Monet & Goyon S4J. So across the English countryside Pip went to collect his new steed “A trip to Dorset and I laid eyes on her for the first time, she was in a rickety old shed where she had been for 3 years, the current owner unable to get her started, I paid him then loaded her up and told him what was in-store for her, his jaw hit the floor as she was 100% original, unrestored condition and offered to buy it back, but she was mine!” Pip didn’t waste his time either, the very next day he was cleaning the points, replacing the leads and sorting out the timing to fire the M&G into life. Knowing he now had a runner on his hands the entire bike was stripped down to the very last nut and bolt so the build of his little lady could begin. I say lady because Pip names all his bikes female names beginning in the letter E, this time around Etta, meaning little one. 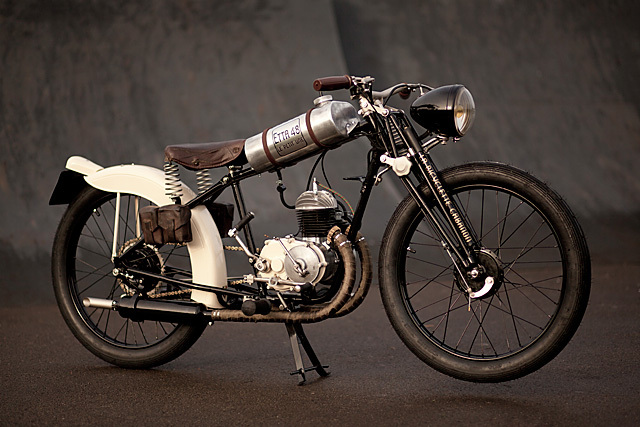 With a bare frame to work with he set about detabbing, smoothing out and cleaning it up so that the bike could appear in only its bare essentials, true racer style. The rear guard was cut down and modified and with no desire for a side mounted number plate the original light section was modified and adapted to fit the back of the guard. Not only does it result in a cleaner, narrower look, but the clever way in which Pip has positioned the assembly gives the side profile a kicked up racer tail physique. With the frame, fender and associated parts out for powder coat in his signature black and cream there was time for one hell of a monotonous task. Every nut, bolt, washer and miscellaneous part was painstakingly prepared over a course of Sundays until they were ready for nickel plating. 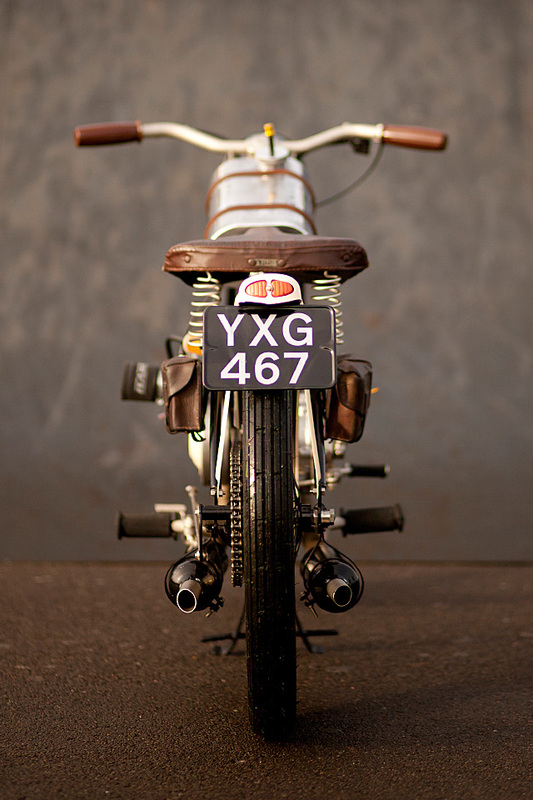 The engine powering this beauty of a boardy is a French 125cc 2-stroke, but it wasn’t made by the men of Monet & Goyon. 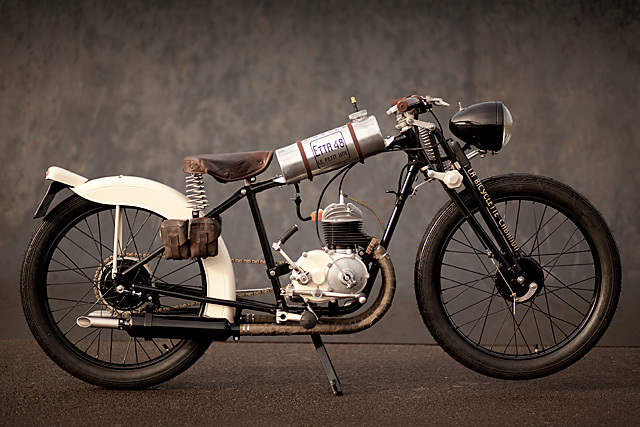 Another French company, Jonghi, supplied many of the 2-stroke engines used by French manufacturers having built a solid foundation of success based on their race winning machines before the war. Jonghi was originally an Italian company that when rescued by an Argentinian industrialist, Tito Jonghi, was moved to France where his factory racers, particularly the legendary 4 valve 350 achieved great success. With M&G not afraid to source components from other companies based on quality their decision has been vindicated by what Pip found when he split the cases. The stepped piston and barrel were still in such good condition they were reused in his thorough rebuild of the engine. How many 2-strokes can you say that of today, let alone some 68 years later. With the foundations of a great little engine Pip set about adding some snap, crackle and pop to the little smoker and sourced a Mikuni VM20 carb with a ram air filter from Allens Performance which was fitted up in the standard side mount location. With new fuel lines and filter in place the performance and rideability has come a long way from the original AM 4/ 2N fuel mixer. The refurbished exhaust looks an absolute treat and very different to the expansion chambers we have become used to, some heat wrap and a lick of black helps to give the bike the racer look it so thoroughly deserves. 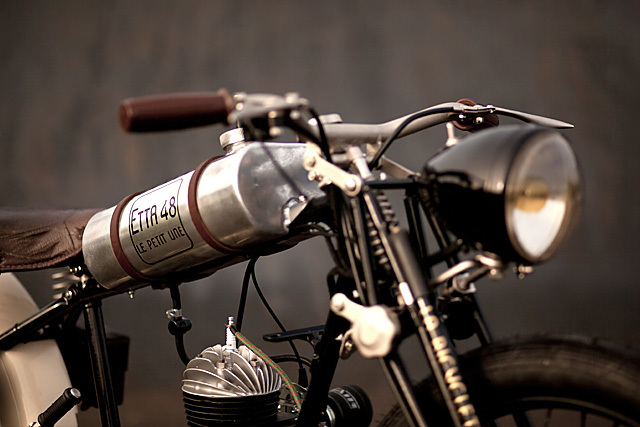 The visual appearance of the engine is also testament to Pip’s dedication to do things right. From the kickstart, to the cases and the period correct plug and lead the end result remains absolutely vintage in its appearance while performing better now than it ever has in its 68 years history. With the engine back in the frame it was time to start piecing this little Board Tracker back together and the factory girder front end in black with its single spring for dampening sets things off perfectly. The skinny rims front and back are typical of the period and are the original items that Pip has refurbished and fitted with the sort of ribbed tyres you would have seen pounding the boards in the ’20s. The rear end is rigid necessitating a sprung seat that has been given a new lease on life while more leather comes in the form of Yugoslavian ammunition pouches ( three for a tenner) mounted to store the supply of 2 stroke. 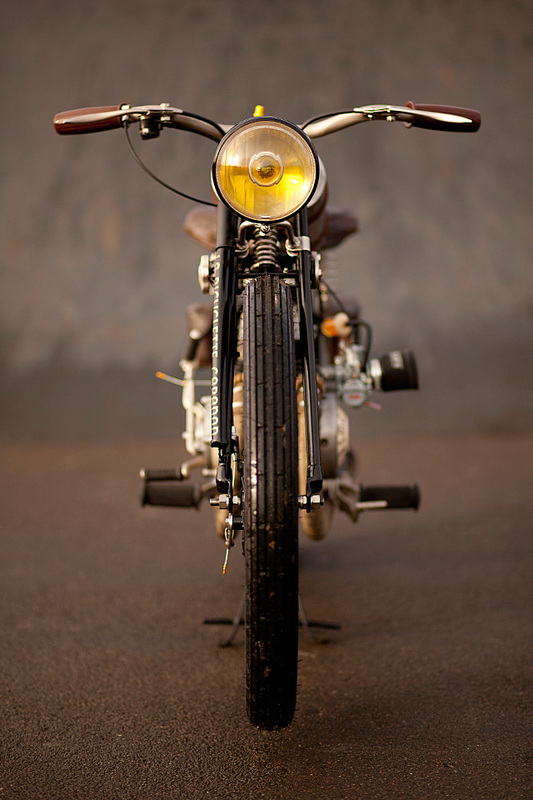 The single headlight is simply stunning and while not fitted to the race bikes of the day, this is a 100% road legal and ridden motorcycle! With that she was done, but Pip just wasn’t feeling it “she fired into life but standing back she just didn’t cut the mustard” The standard tank didn’t look right, it was original and it’s not every day you see a Monet & Goyon flash past you on the road but it didn’t have that racer feel. So with cardboard in hand a template was made up that was sent over to Ryan at Runriot who put his skills to work making a period piece that would have been the pride of the paddock back in the day. Two leather straps were added that give the appearance of holding the tank to the frame and the final lettering was applied. If it was somehow possible imagine Pip and Etta transported back a 100 years, man and machine from across the Atlantic taking on the Americans at Speedway Park in Chicago in front of the regular crowds of over 70,000 Board Track Racing fanatics. 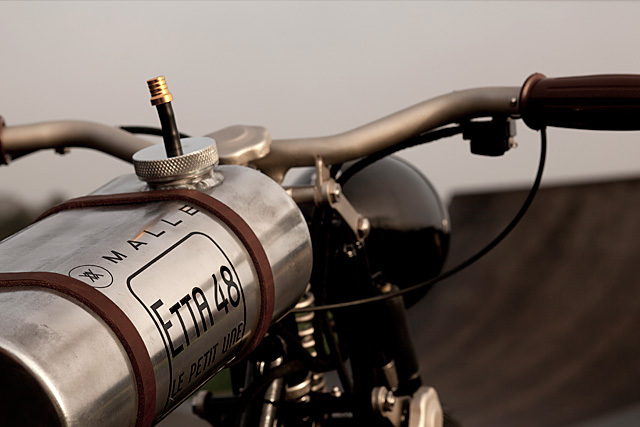 The boards might have aged in the weather, been pulled up and the stadiums packed away, but thanks to builders like Pip the legacy of those times and the revolutionary work of two French motorcycle companies will live on as Etta blasts around the English streets.